While we know generally where the money would be going if voters approve the bond, the exact breakdown of spending is still subject to change, as it was pulled from a draft of the Mayor's back in June. 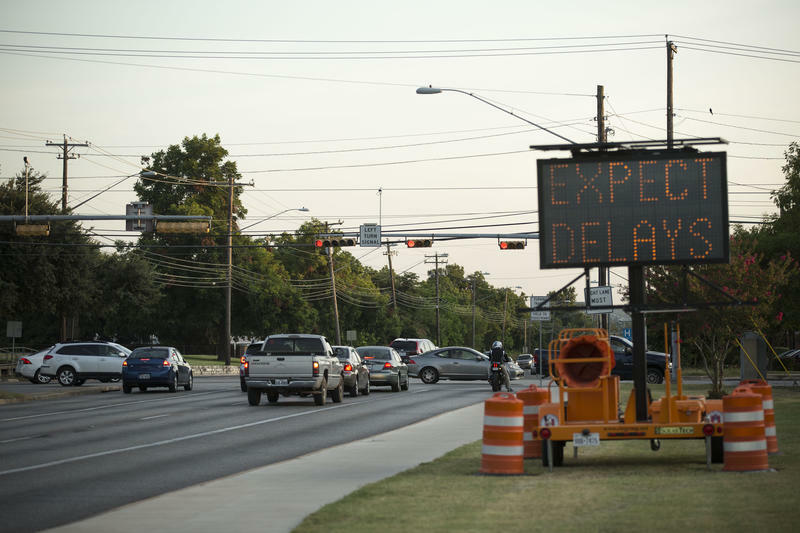 But, a majority of the money – $482 million – would be spent mostly on implementing changes to eight – or nine, depending on what city staff decides – of Austin’s major streets. 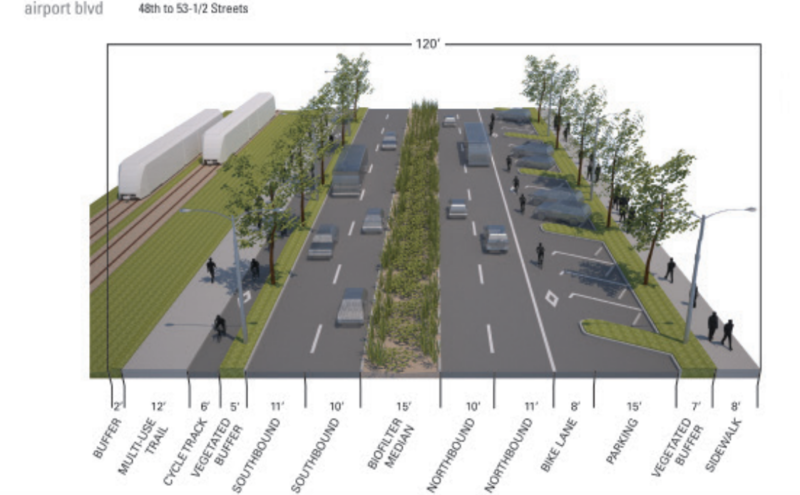 The remainder of the money would go to planning, changes to smaller outlying roads and safety, sidewalk and bike infrastructure not included in the plans for these major streets. Flip through these plans and you might notice something surprising for Austin: an emphasis on bike lanes and sidewalks. In 2014, the Austin City Council adopted a Complete Streets Policy, which focuses on green spaces and multi-modal transit. It’s important to note that, while the Mayor’s proposed spending on some of these street plans (particularly North Lamar, Burnet, Airport and South Lamar) appears to fund these changes in full, city staff has noted that taking into account project management costs and inflation, funding all the street plans (those portions that are within city limits) would cost closer to $1.5 billion. While some funding has already been set aside for portions of these street plans, the funding is minimal and most of it would be coming from a 2016 bond. Click on the highlighted routes on the map below to see a description of the proposed upgrades. Short-term recommendations include helping out those forgoing car transit by installing pedestrian hybrid beacons and sheltered bus stops. Additional short-term changes can be seen below at the intersection of North Lamar and Rundberg – including raised, tree-covered medians between travel lanes, wide sidewalks and bike lanes. Staff recommends over the long term installing additional turn lanes, sidewalks and adjusting signal timing. Read the full plan for North Lamar here. 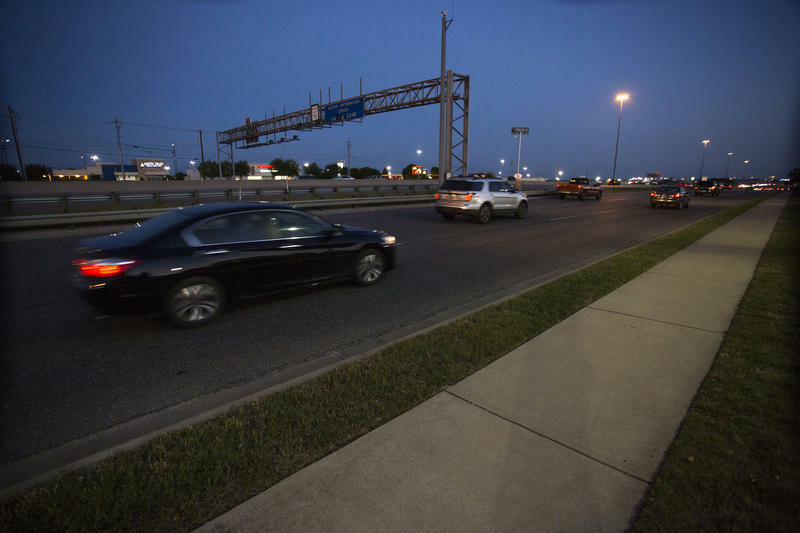 Short-term changes mirror those for North Lamar, with a focus on pedestrian safety (installing pedestrian hybrid beacons) and easing drivers’ turning woes by building more right- and left-turn lanes. In addition to the revised look seen below (medians, bike lanes, etc.) long-term changes also focus on turning lanes, with recommendations to install left-turn lanes at Braker and Kramer Lanes. Read the full plan for Burnet here. Many of these recommendations assume that there will be light rail along this corridor – but consideration of light rail during this bond election seems unlikely (read here). Short-term recommendations include closing off driveways to improve safety and widening or building sidewalks to be at least 12 to 15 feet wide. 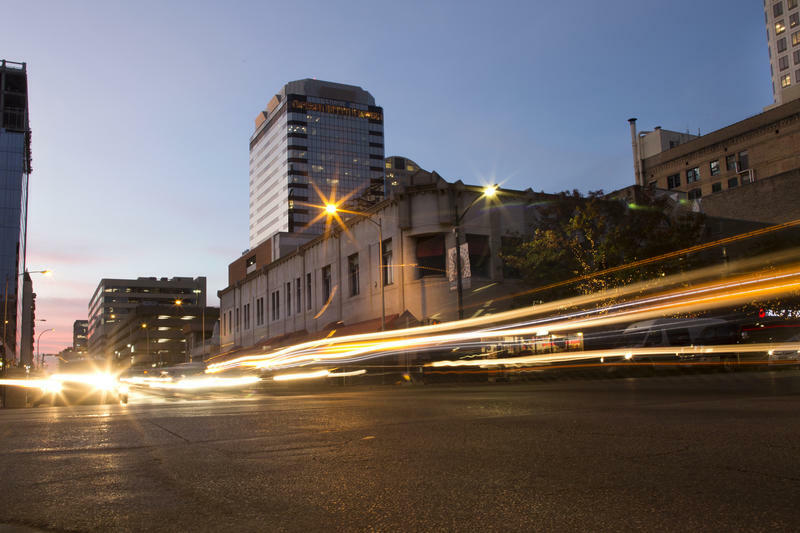 Two long-term recommendations include reducing the number of lanes on Riverside from three to two and building a seven-to-eight-foot protected bicycle lane. Read the full plan here. 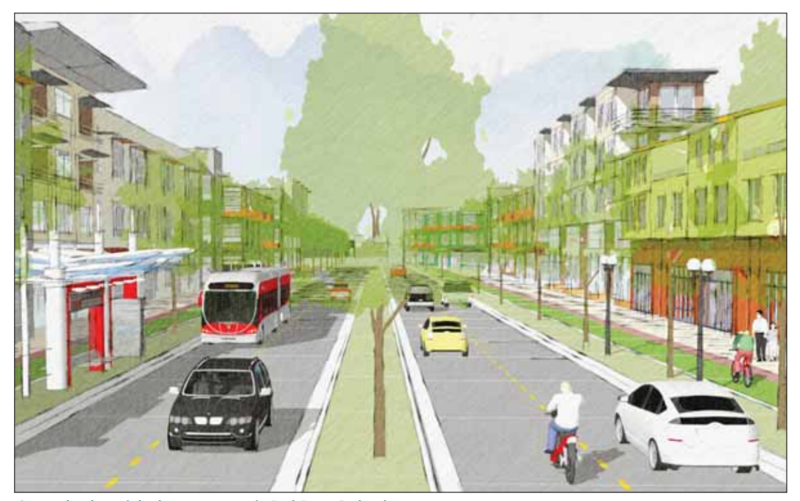 Part of this plan is already underway at East Riverside and Lakeshore Boulevard. It’s being funded by money from a 2012 transportation bond. Short-term changes include a focus on pedestrian safety by installing pedestrian hybrid beacons at intersections like Airport and 55th Street and Airport and Zach Scott Street. In addition, staff recommends adding turn lanes at Airport and Manor Road and Airport and Aldrich Street. Over the long term, recommendations include maintaining the roadway’s four lanes while building out alternatives to car travel: bike lanes and sidewalks. Most of the costs have been targeted for the section of Airport between MLK and Levander Loop. Read the full plan here. The mayor has said bond money will not be spent on the portion of corridor plans outside the city of Austin – that’s most of this corridor plan. 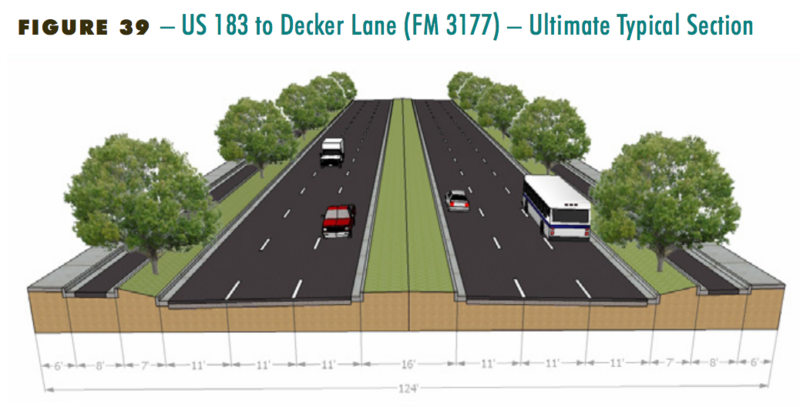 Many of the recommendations within Austin are short-term changes, most of which focus on bike lanes and sidewalks – including the building of a new sidewalk on one side of FM 969 between US 183 and Decker Lane. Read the full plan here. Short-term changes include building a two-way bike lane between Riverside Drive and Barton Springs Road, installing new B-cycle bike rental stations and building covered bus stops. 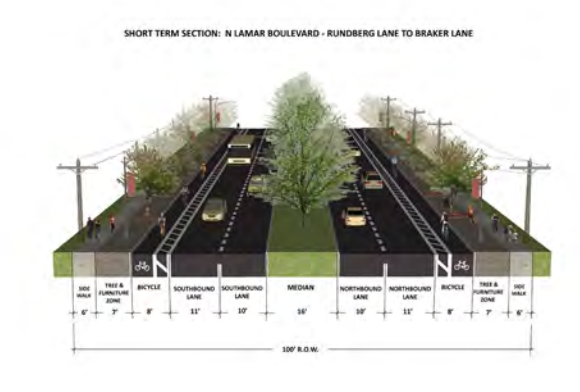 More than half of these costs focus on long-term changes to South Lamar between Treadwell Road and the Brodie Oaks Shopping Center, envisioned as a four-lane roadway with raised medians separating car lanes from bike lanes and sidewalks. Read the full plan here. While this street study is still ongoing, the city has some moves in mind. 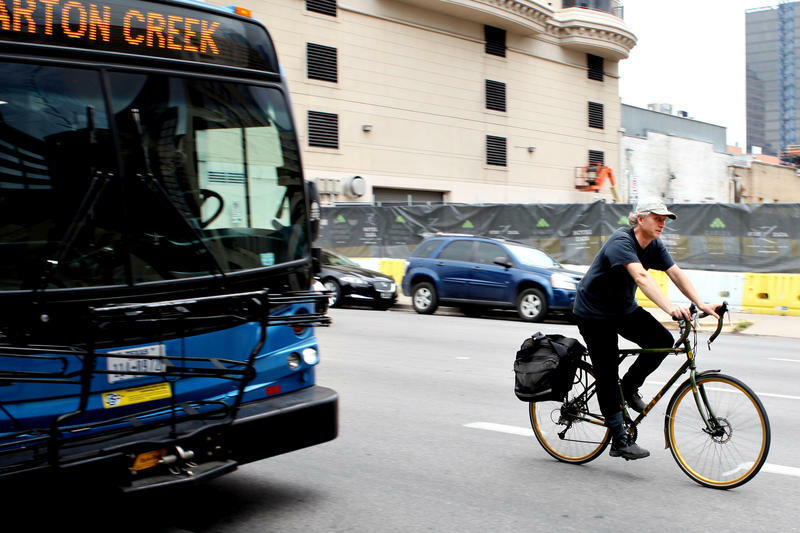 City staff’s preferred change includes diverting bicyclists from Guadalupe and onto Nueces Street between 29th and 24th streets and removing a parking lane from a portion of The Drag – replacing it with northbound and southbound bus only lanes. Read some preliminary ideas from staff here. These streets were added last-minute in June when representatives of South Austin districts made note of few funds going to streets in their districts. While it's unclear how much could be funneled into these roads, it would most likely go towards creating a street plan as we have for the above streets. The remainder of the $720 million would fund sidewalks, urban trails, bike lanes, changes to smaller roadways plus future street plans like the ones above. Here's a (preliminary) breakdown of what that would look like. Much of this represents partial funding of these plans. For example, to build only the highest-priority sidewalks would cost the city roughly $200 million. Fully funding the Bicycle Master Plan would cost about $150 million. *Note: An earlier version of the story included specific amounts for proposed spending. While those were floated by Mayor Steve Adler, the council never ended up approving spending per corridor plan.